A bumper post to make up for lost days. 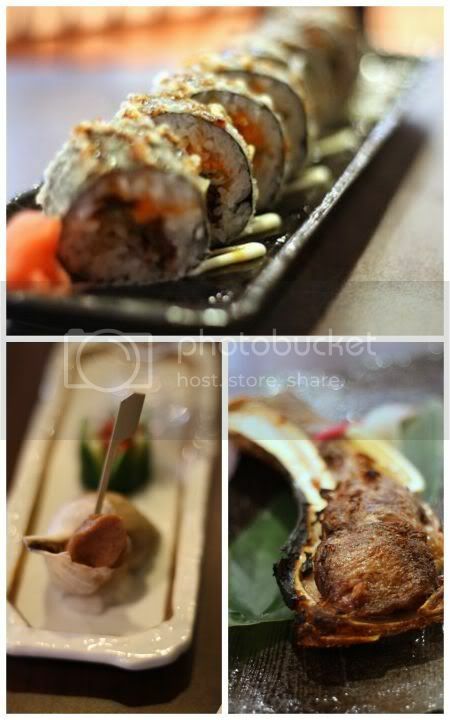 Hope this stirs up your tastebuds for Japanese food! 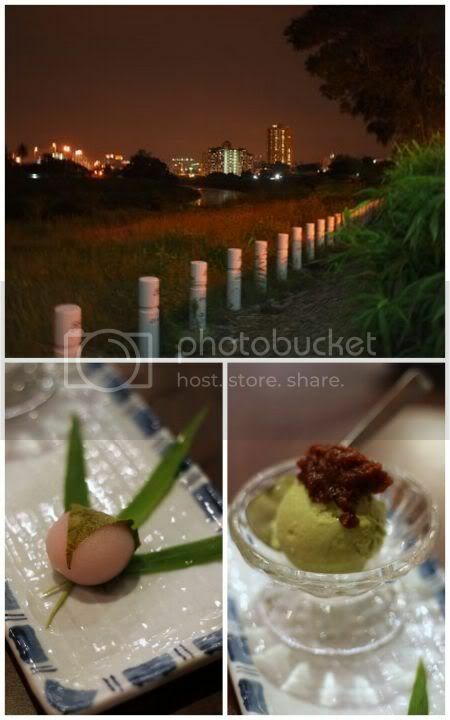 Recently I was invited to join the Red FM deejay Alison Victor for her review on Ishin Restaurant located just off the ever busy Old Klang Road. Usually a weekly jaunt, she reviews various restaurants on air from noon (when our tummies rumble for food) and offers dining vouchers to these places - so tune in at FM104.9 to grab the great deals (She is doing Ishin this week and giving away RM100 dining vouchers). That review on Ishin got me thinking on how varied the food offerings is on this incredibly iconic road (it used to be the main thoroughfare from Klang to Kuala Lumpur before the Federal Highway came up in the 1970s!). A little digging revealed while it is a predominant Chinese area, globalisation seems to be creeping in with Japanese cuisine to give their residents a varied plate of goodies. One trend I noticed about Japanese outlets here - value-for-money deals rule as they have to cater to a crowd that love to get their Japanese fix without breaking the bank. I suspect Ishin is going to be those blogged to death places soon, so bear with me while I spin my take on this new kid on the block! 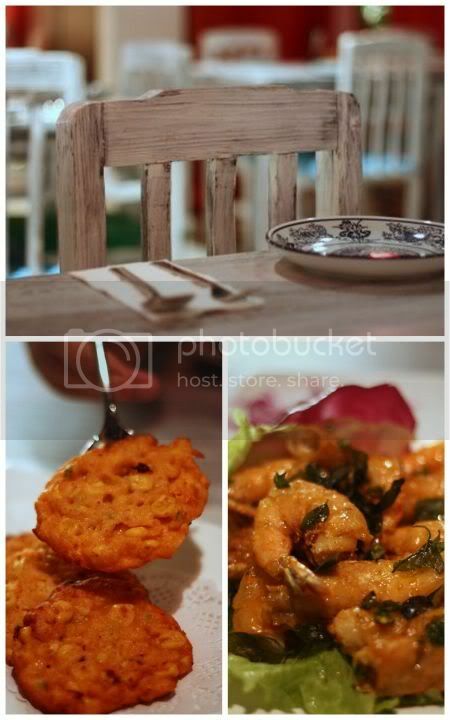 Opened for four months the restaurant is located at a bungalow just off the busy Old Klang Road. Formerly a laundry, it seems they converted the place quickly to fit the restaurant to open just in time for last year's Christmas festivities. The owners are now in the midst of working out phase 2 - beautifying the place and doing those things they missed out when they first opened. The kitchen is run by Chef Q or Chef Kew, formerly from Xenri D'River Terrace just down the road. The friendly chef used to work under Fukuya Restaurant's Chef Ando, which explains some similarity with Chef Ando's food (the sesame tofu cube in my appetizer was similar to one I had before in Fukuya) especially since he practices the art of kaiseki or omakase where the chef will work out several courses based on seasonal ingredients flown in from Japan. Chef Q definitely knows how to impress us with his first dish - a pretty composition of pink tinged petals with giant grilled fava beans, bright green marinated sweet plums, sesame tofu and baby crabs! 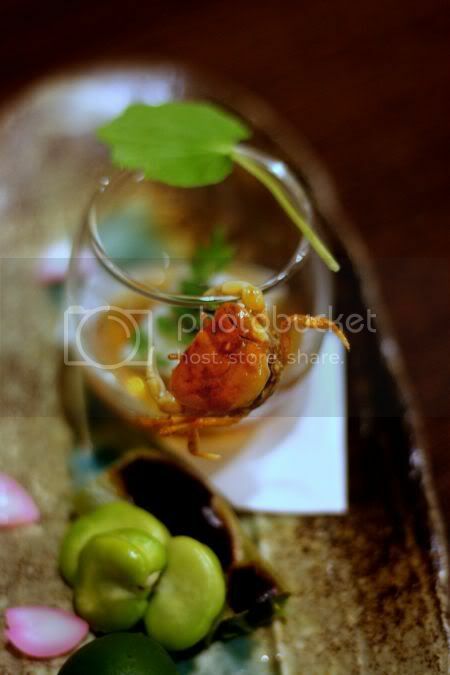 We took the most time with this dish purely because we had numerous picture sessions with the baby crabs. While they looked amazing, tastewise they are mainly just the crunchy shell with not much sweet flesh within. I loved the grilled gigantic fava beans - so sweet and yummy (seems they also import in fresh edamame!) while I wasn't too hot about the sesame tofu since its texture was more bouncy versus silky soft. 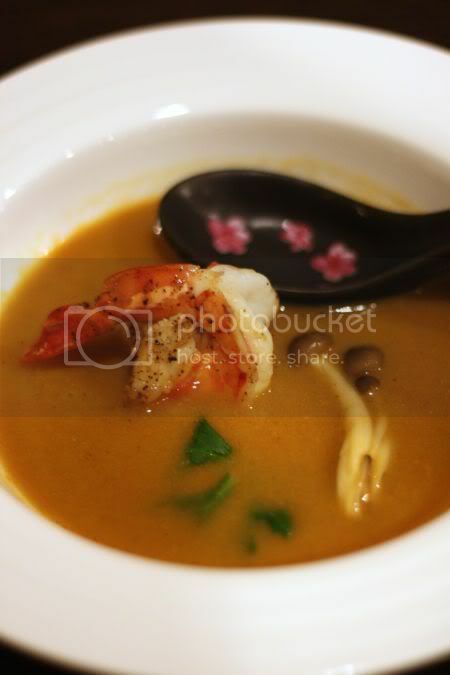 Next was a twist to the Japanese meal....a prawn bisque that looked like it stepped out from a French kitchen. The rich tasting soup was paired nicely with a bouncy grilled prawn and shimeji mushrooms - simply tummy warming and so satisfying. Then came another eye popping dish - the assorted sashimi platter piled high on ice. It was hard to choose what was my favourite among the fresh strip jack, amaebi (prawns), yellow tail, uni (sea urchin), jumbo prawns, salmon, flounder, butter fish and meji tuna belly. Up next was the interesting salt grilled tuna jaw. Technically looking at that piece we were served that night, it resembled more the head of the tuna fish minus the eyes, rather than just the tuna jaw. Xenri also serves the exact dish except their cut is just the tuna jaw. Ishin's version is much nicer purely because the fatty bits from the mouth combine so well with the drier white tuna flesh. Am not so sure if they just serve the grilled tuna jaw only on normal occasions (it can be ordered from RM68 to RM100 on the a la carte menu) but Chef Q did mention this piece was definitely bigger than what is usually served in the a la carte selection. The tempura was another fun time - playing with the fan-like somen noodles fried with teeny weeny flour bits. It was so fun, I almost forgot to eat the scallop tempura with sweet potato. The sweet potato bits were my favourite and like Aly said, it reminded one of the goreng goreng stuff we get from the stalls. 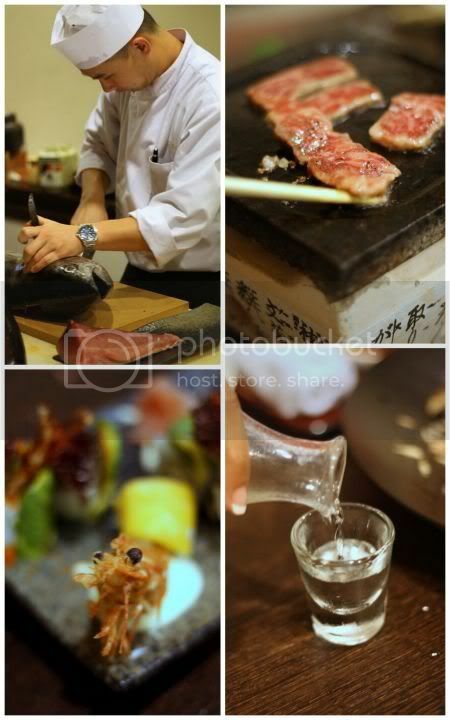 Despite our full tummies, the food kept rolling on.....with the stone grilled A5 Kagoshima wagyu beef. Literally a cook-yourself dish, you cook your fatty beef slices on the hot stone grill. A miso sauce is served on the side but believe me, you don't need it as once you sink your teeth in that piece - the beefy juices mingling with the oozing oil is good enough. Next came the makis - all of Ishin's signature rolls - phoenxi rolls with prawn and avocado, hawaiian roll with prawn and mango, special house roll with a tempura prawn and a sweet homemade sauce drizzled over it and the caterpillar roll with softshell crab and avocado. Believe me, by then the stomach was protesting and saying it can't take anymore. Out of the ones I tried, I liked the sweet tasting and unusual mango topped Hawaiian roll. Last but not least, it was an assortment of ice creams - served on a bed of shaved ice. Imported in from Japan, you get unusual flavours like wasabi (that tasted very nice indeed), peach, melon, lavender, sakura or cherry blossom, citrus, black sesame and the must-have Japanese classic green tea. 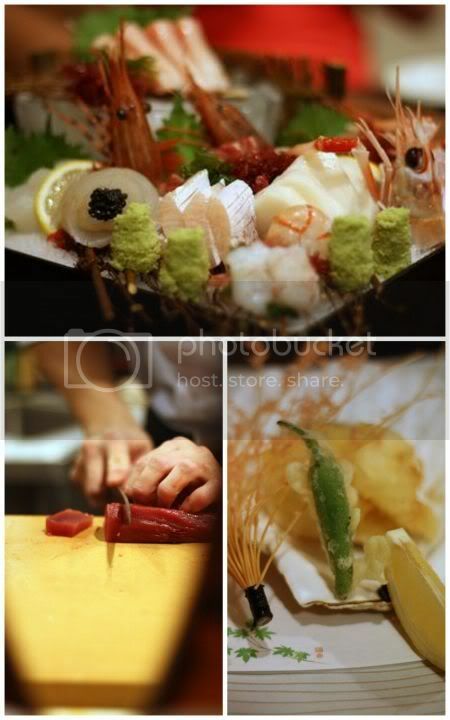 Really a good deal I reckon - 8 kaiseki courses for RM180++!! I personally reckon that it can be shared among two people, as it is a lot of courses to go through on your own. 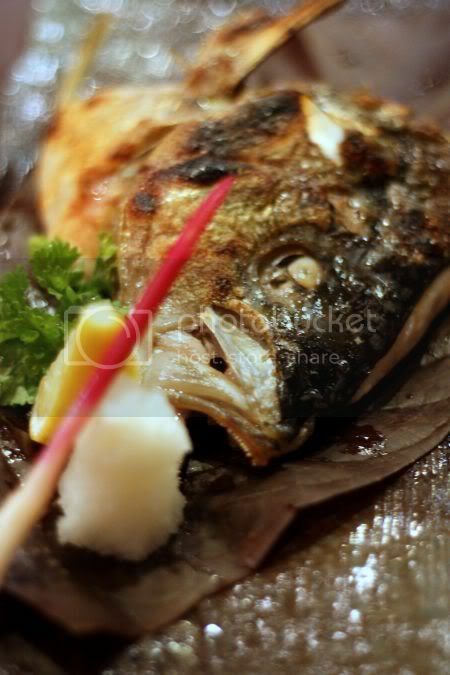 The fish like all other Japanese restaurants are flown in on Tuesday and Friday so check those days out for fresher than fresh items from Japan. The restaurant also brings in whole tuna fish aka meiji maguro (we saw them carving up a 11kg whopper when we were there) and hopes to bring a different variety in the furture - kindai maguro that is a sustainably-raised blue fin tuna. 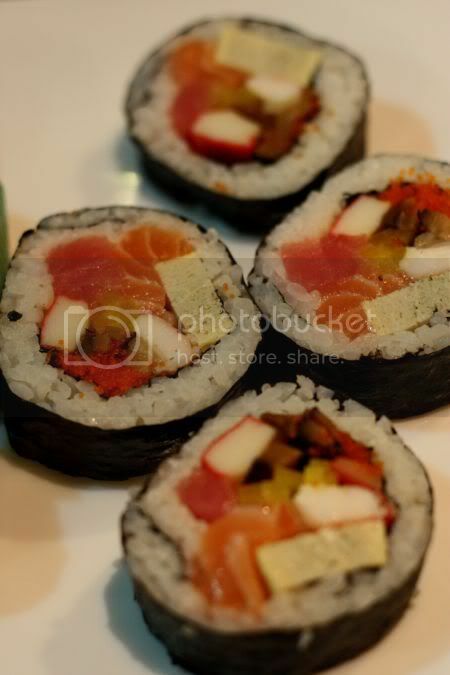 For more information on Ishin including their menu or what is freshly available, check their Facebook page. There are even discounts for Facebook fans. The place definitely seems to have captured customers as it was packed on a Monday night. Seems weekend has them also packed with customers so book to avoid dissapointment. Good place for kaiseki especially if you have a huge appetite and can't be bothered to think on what to eat (great after a long day in work!). 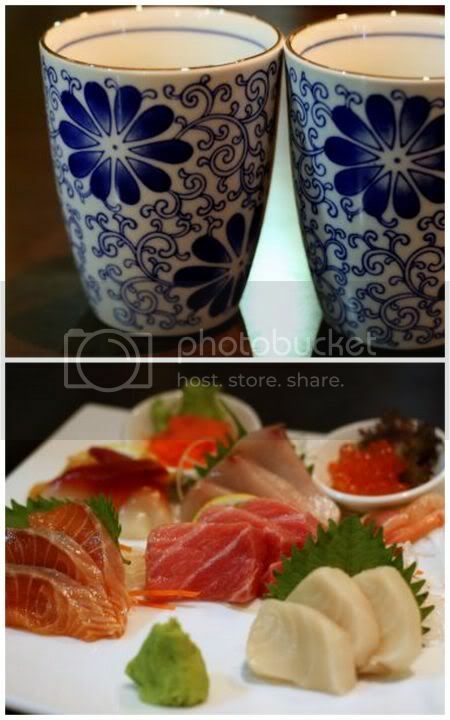 Their kaiseki is very similar to Xenri's but have more unusual items given. Will have to return to give their other a la carte items a spin. Book also during weekends as it gets full. Offers discounts for their facebook fans. To join, click this link. For more pictures, see the Flickr set. One has heard a lot about this legendary place...purely for its value-for-money Sunday buffets. Located just next to the river (hence the river view in its name even though technically you don't see it from the restaurant! ), it is advisable to get here early during the weekend or book! We arrived for an early dinner on Saturday night and found the place packed already at 6.30pm!! Stream of people kept pouring in throughout the whole night signifying that the residents of Old Klang Road definitely has a hefty appetite for Japanese food. While Xenri does have an impressive menu (that kinda resembles Rakuzen in looks), we went for their kaiseki meal to give it an equal comparison with what I had in Ishin earlier on. Service is kinda lacking here - when we asked the wait staff about the kaiseki meal and how much it cost, he had to check, be reminded one time before the answer came back. The staff seemed more equipped to handle set meals, as I could spy other tables having quick meals while we dawdled over ours for about 2 plus hours! Priced at RM180++, the kaiseki meal at Xenri bears a close resemblance to Ishin probably because Chef Q was formerly from there and the food is based on seasonal ingredients available around the same time. The appetizer was a simple set up - three varieties of a spinach ohitashi (in soy sauce), cucumbers with natto and the slightly chewy sea snail (something Ishin served in another kaiseki meal they had before if you read the blogs). Since the kaiseki set was for one, the sashimi didn't look as impressive as the Ishin version for four people, but each slice of the sashimi was bouncy, sweet and fresh. I loved the sweet tasting prawns, just the same as the one we had in Ishin. Next came the soup in a lovely shiny golden bowl with a large clam. While the seafood was fresh, the soup didn't have any sweet taste and was more towards a konbu broth laced with julienned ginger and seaweed. As I wasn't too sure about the portions, I had also ordered a spider maki (RM30) and the grilled tuna jaw (maguro kama shioyaki for RM78). I admit I wasn't too impressed with the maki, as the taste of the soft shell crab wasn't evident and seemed to be drowned by the rice and other ingredients. The grilled tuna jaw was huge - you had to dig dig dig around the large piece of bone to get to the sweet tasting flesh. Unlike the version in Ishin, I felt this one fell short as we got the darker tuna flesh that didn't taste so sweet. The lack of any fatty bits also made it a little dry. Instead, I thoroughly preferred the grilled amberjack fish head they served with the kaiseki set - delicate white flaky sweet tasting flesh that had me digging each part of the fish with vengeance. There was so many courses, that after a while I got a little confused on what came next. We had the stone grilled wagyu beef, just like Ishin that was Splashie Boy's favourite. I loved the tempura they served, as it had a light pale yellow batter that wasn't too oily. The mix was vegetarian - shimeji mushrooms and green peppers. Unlike Ishin, the carbohydrates were in a form of a bowl of noodles. While it was simple, it was a delicious ending as the broth was sweet and I especially liked the mountain vegetables topping the strands. Dessert was quite run-of-the-mill with a scoop of green tea ice cream topped with red bean paste and a mochi. 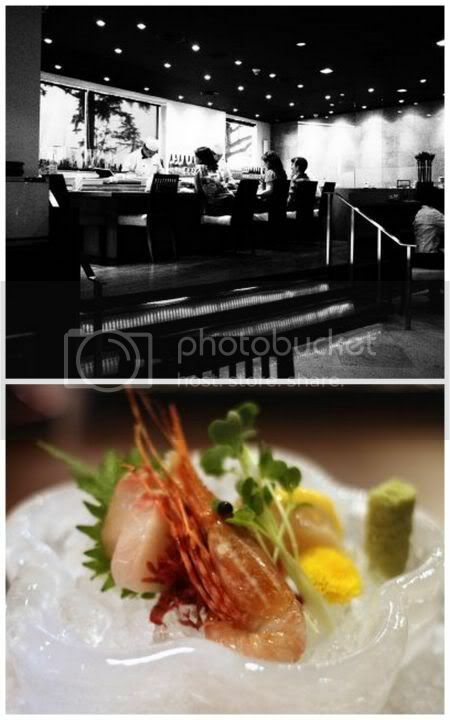 The lowdown (minus the fluff): The kaiseki set does not seem to have the "wow" factor featuring run-of-the-mill items. Prices are a little higher compared to Ishin but they give you dining vouchers for their sister restaurant in Menara Hap Seng with your bill. Service seems a little lacking too. Nevertheless, good place for the set meals but best you book ahead as it's packed with people! For more pictures, see the Flickr set. Eating here brings back a flood of memories....as this place is so near my friend's place where we used to spend happy times. I remember there used to be a fantastic Hokkien mee place round the corner here, where we got to satisfy those midnight cravings. Sadly that seems to have gone with the wind like all old places. 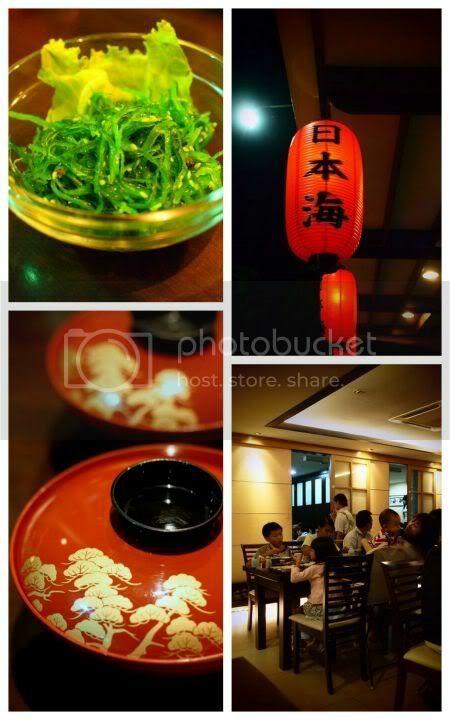 Just off the main road, you can spot the red lanterns blowing in the wind to signify you can get your Nippon fix here. This place seems to cater to the locals and even on a weekday, it's overflowing with people. Located at the corner shophouse, you get a choice of sitting al fresco (if you're puffing on some cancer sticks! ), downstairs that seem to be quieter or the more happening first floor where tatami private rooms are available. Families and large crowds of people seem to frequent this no frills place. 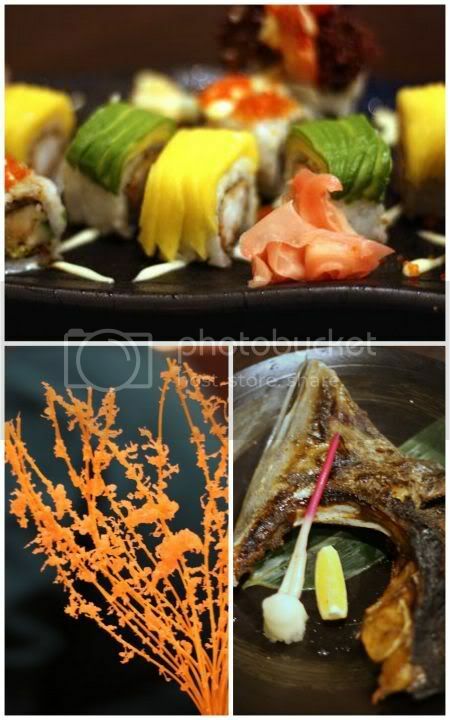 The menu offers simple home styled Japanese food mainly in set meals, good for those who are not looking for anything exotic. Don't expect any exotic fish here as they only offer run of the mill sashimi items like salmon, tuna, butterfish, ebiko, ikura, akagai and etc. The mix sashimi set (RM53) is decent but not exactly super fresh. We fared better with their hefty futomakis, the Nihon Kai Maki - stuffed to the brim with salmon sashimi, crab stick, egg, pickle radish and mushrooms. It's so hefty there is no way you can pop one in the mouth!! Other items we also sampled were their nameko shiru (RM5) - miso soup with nameko mushrooms and the greener than green chuka wakame (RM5) topped with sesame seeds. The lowdown (minus the fluff): Good for a simple and unadventurous set meal with family or friends. We loved their enormous futomaki that will fill up the belly. For more pictures see the Flickr set. 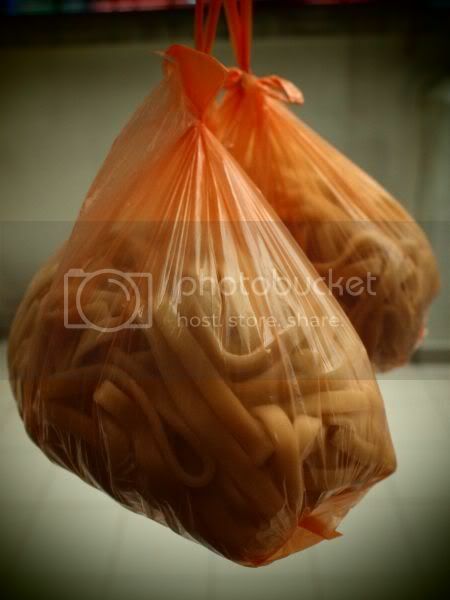 Nowadays, searching for the best ever Hokkien fried noodles is kinda like looking for a needle in the haystack ......or maybe the holy grail! My uncle has a theory that those fellas who used to wok up an aromatic charcoal black noodles with loadsa flavour have retired from active wok duty, hence the ones we now get just don't make the cut. He does have a point as I have blurry visions and memories of superbly great Hokkien noodles at the old D&C bank's corner in the city centre long long ago when I was a wee little one. Literally the heart of the city - the buses will gather across the road, adding a little "extra" into the already black-soot-like noodles, whenever they zoomed past. We used to chuckle, "that's why it's so tasty.....the secret ingredient is from the bus." When asked what's the secret to great tasting Hokkien noodles, people often say, "it's the fried lard bits" but there's actually more to that. While fried lard bits add a certain charm (and sinful crunch) to the silky black strands, it's actually the braising or "gau in Cantonese" part that seperates a great tasting Hokkien noodles from the sea of mediocre ones. 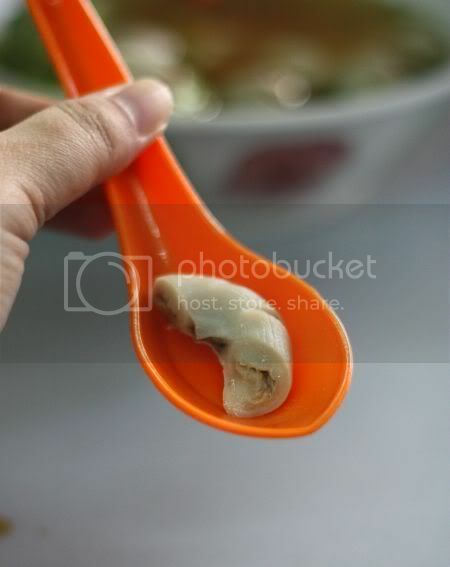 An aromatic stock is a must - flavoured with a pinch of the dried flat fish (chor hau yee) grinded into a powder, which the noodles are boiled in until the sauce thickens. 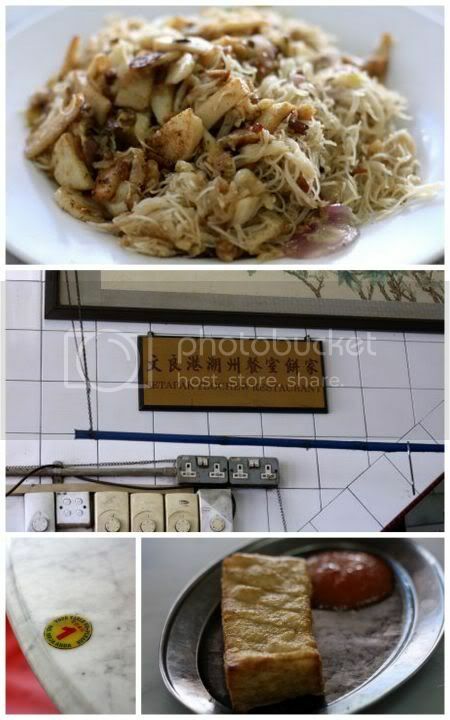 At this 100 year old restaurant more renowned for their flaky Teochew mooncakes and wedding biscuits, a must in any well deserving Chinese traditional wedding - it's a surprise to find they make one of the best ever Hokkien noodles (RM6 for a single portion). 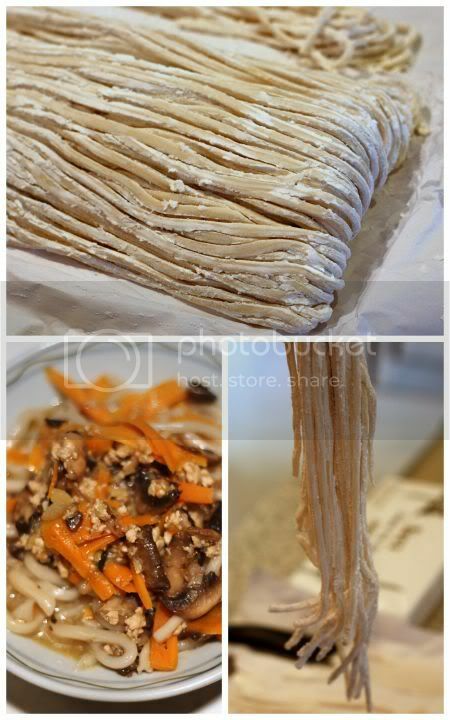 Their secret weapon - their own handmade noodles. Flatter than the yellow round noodles (tai lok mee) we usually find at other stalls, this one boasts of very little or no alkaline water, hence they taste is so much better and less artificial. Braised until the sauce just coats and hugs each strand of the noodles like a silky black dress, it comes without any fried lard fritters but is redolent with the scent of lard, since it is fried with the sinful oil. Owning up to its Teochew roots, you will find a fishball under the mountain of strands. 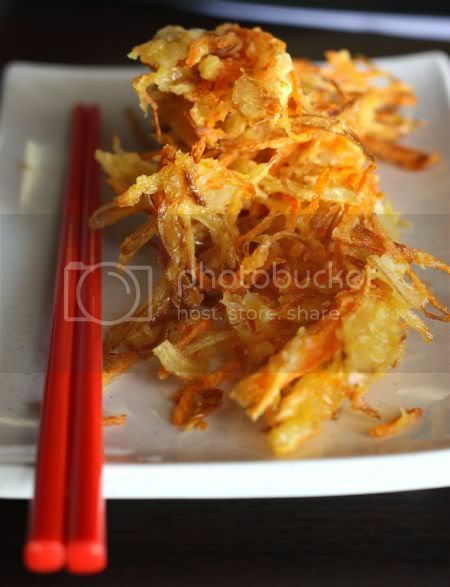 Another crowd favourite is the white fried beehoon, a pale looking noodle unanointed with dark soy sauce. I've eaten this before and liked it but this time round, it was a tad too oily. 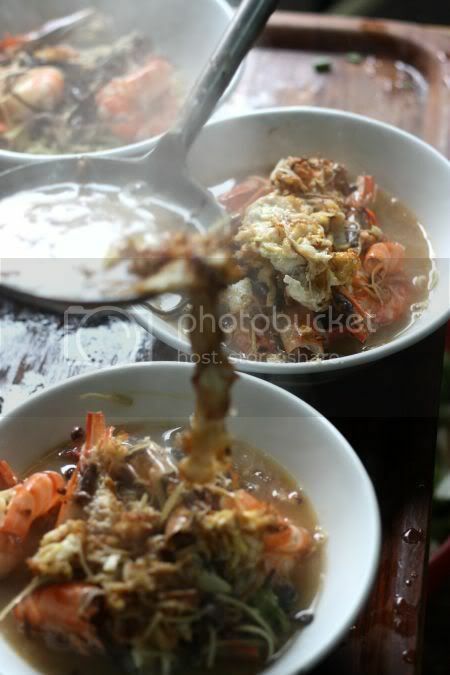 Nevertheless, it was still very aromatic and laden with ingredients (dried prawns, sliced fishcakes, shallots). I liked how they added a green chilli to the mix, which renders a teeny weeny tingle to your tongue from the spiciness. 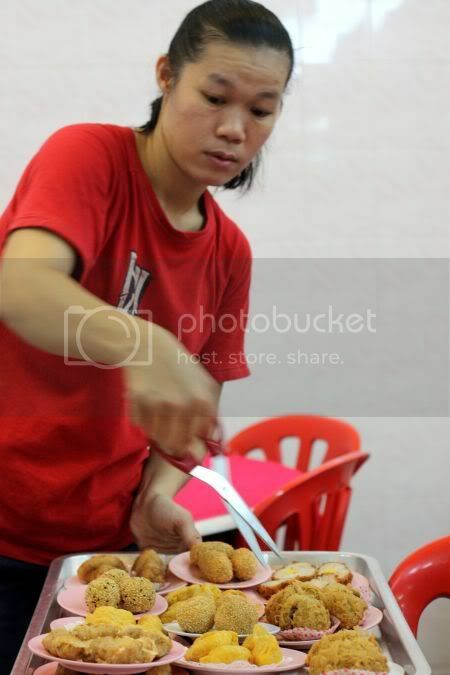 They also serve fishcake - deep fried with a crispy skin - utter yumminess! On the biscuit level, we gave one a try. While it had a light flaky pastry that was fresh, I didn't quite like the sparse and not aromatic tau sar (mung bean) filling. 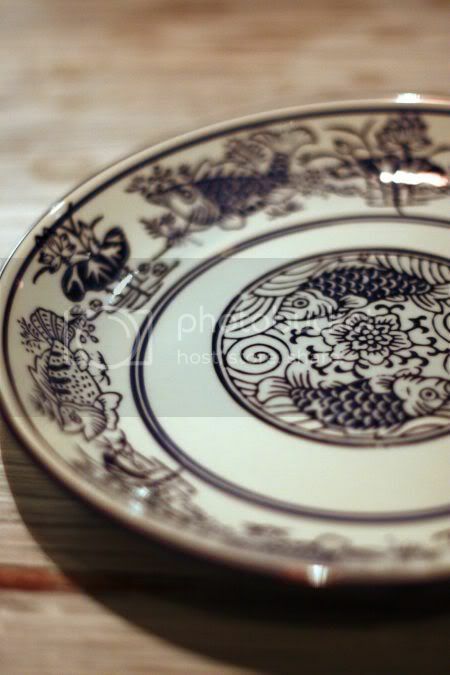 They also have other traditional biscuits like the rice crackers, another must for Hokkien weddings. 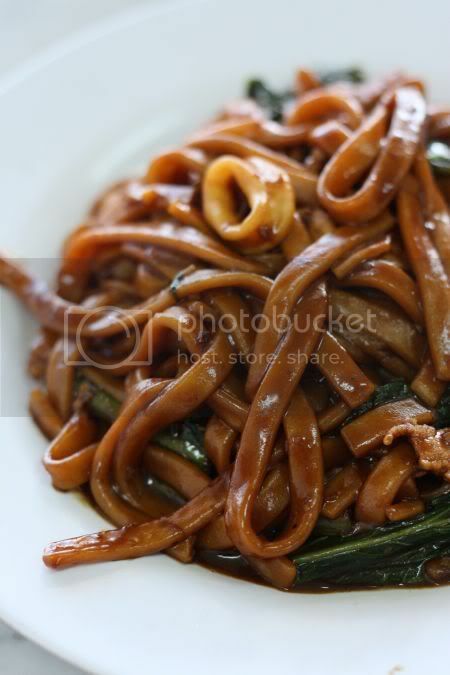 One thing that baffles me though, how a Teochew place is serving Hokkien styled wedding biscuits and noodles!! Oh well, guess there could be some intermarriage somewhere, hence the cross of cuisines somewhere. Lucky us, as it meant we get to enjoy these wonderful noodles. It feels kinda weird to indulge in dim sum at night, probably because our brain is attuned to accept it as a breakfast or brunch. 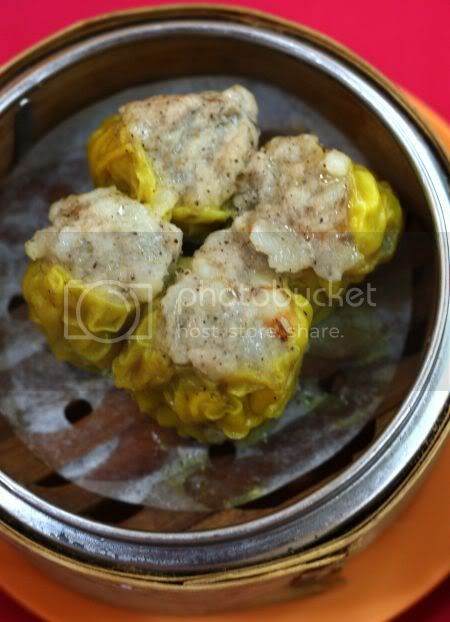 Hence when a friend of mine, Debbie mentioned night time dim sum at Sungai Buloh, I was fascinated, as didn't this mean you had the best of both worlds? 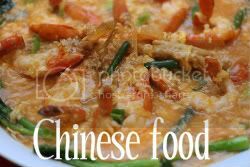 No need to wake up early in the morning and forsake your beauty sleep while you get to munch on those delightful morsels of food, the Chinese nicknamed "touch your heart". Braving a torrential downpour, we arrived at Sungai Buloh a little damp from the rain but was glad that the rain was a blessing in disguise since it meant less people at this usually packed spot. The dim sum here falls in the category of the street food kind - chunky versus the dainty morsels usually found in Chinese restaurants. There's an old fashioned feel about how they serve the dim sum here - servers carting large wooden baskets of steaming items for you to select what you want to indulge in. There's loads to choose from, until you get a little confused after a while with the riot of colours and choices. According to Debbie who is a regular here, they often introduce new items here to give everyone a varied palate. Highly recommended by Debbie were the unusual lala dim sum - large lala shells (still with the clam intact) stuffed with chunky pork meat and bits of prawn. There are two varieties of this, one with a creamy sauce with a touch of cheese and a fragrant black pepper sauce. Both are equally delicious and moreish items you wish to keep eating. 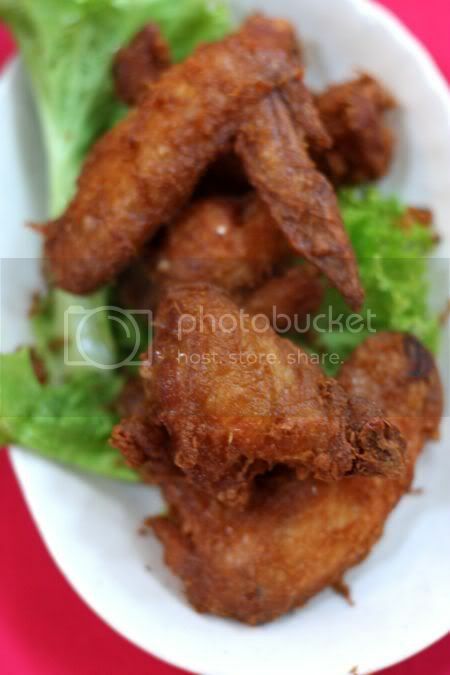 A new item on the menu that night were the deep fried chicken wings - juicy pick-me-up-and-get-your-hands-dirty food that taste so sinful but good. I especially liked the black pepper siu mai, an unusual item that perked up my tastebuds. 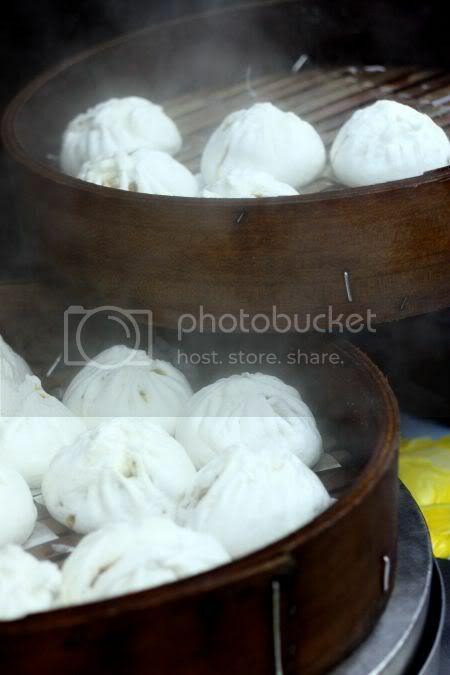 The steamed char siu pau is good too, so are the other siu mai selections. One item we couldn't get enough were the deep fried sesame balls, with an aromatic peanut filling that screamed yumminess to my tastebuds the moment I bit into them. Needless to say, this was enjoyed by all (it's a favourite of her kids) that it needed a second order before we were fully satisfied. 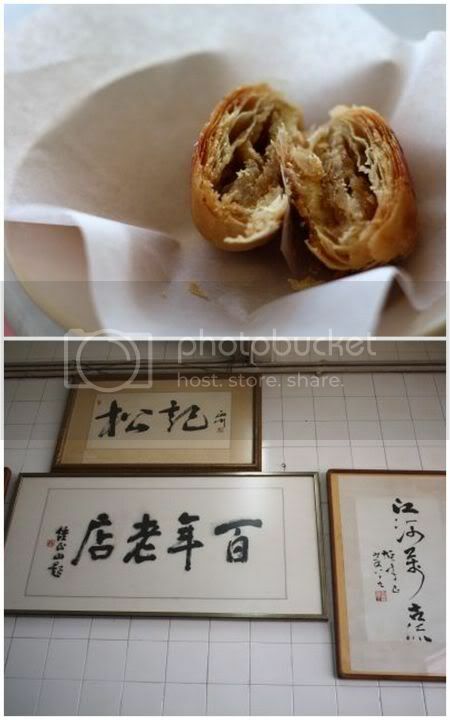 They also do similar versions with sesame paste but order the peanut ones as they are very good. Generally, everything else is good and satisfying - completely worth braving through the rain and traffic. 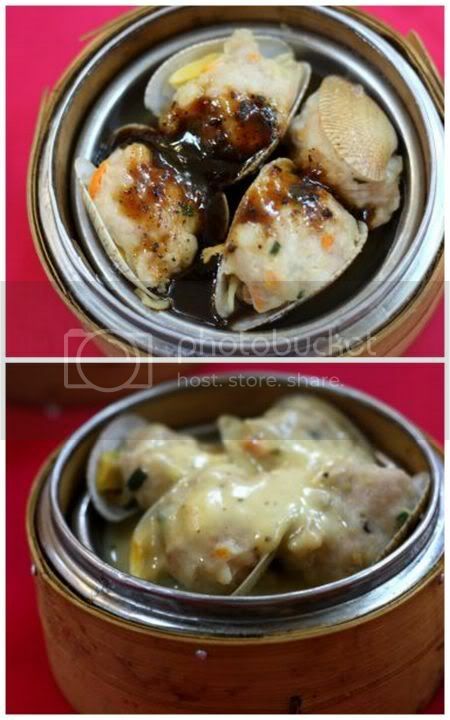 So next time you get hit with dim sum cravings, give this a place a spin! Food is good here, reasonably priced and it's not laden with loads of MSG. Incidentally, do go support my friend Debbie as she is interviewed by Fried Chillies on Nonya food. The low down (minus the fluff): Excellent place for dim sum cravings especially at night (or morning if you're a traditionalist). 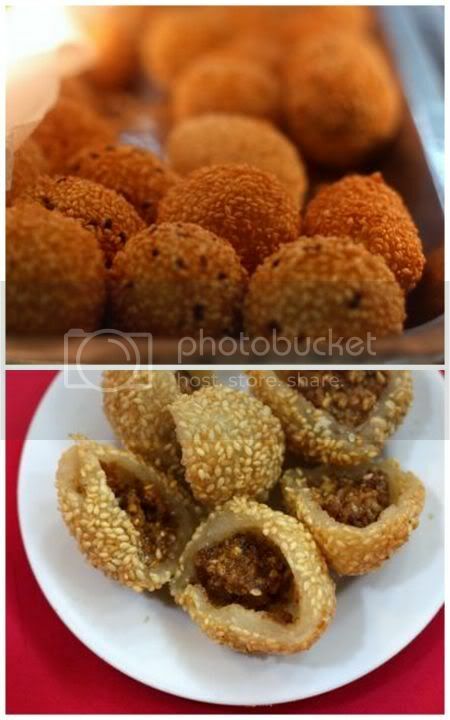 Focus more on the steamed items with chunky fresh fillings but throw in a deep fried sesame ball as dessert. I've heard egg tarts aren't great here, so give that a miss. Last weekend, IR1968 seemed to be the highlight - firstly, for being featured in The Haven, The Edge's pullout magazine together with the other places at Terrace @ Hock Choon and secondly, in the Malaysian Insider's food blog. 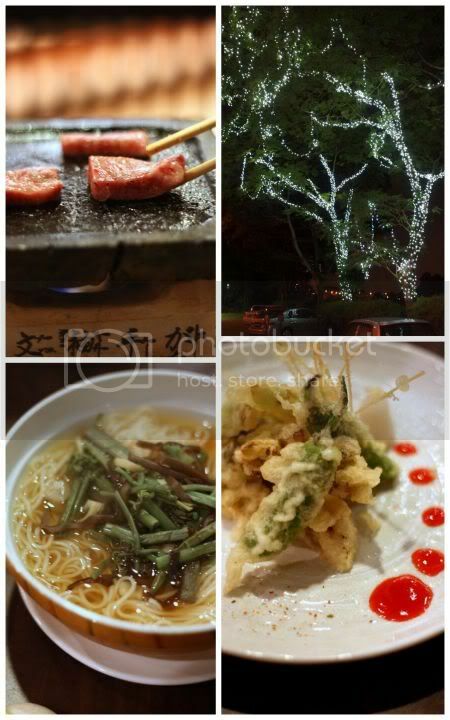 My interest was definitely piqued hence we decided to visit the place last week for a quick dinner. I must admit I was fascinated when I read about this place that first started out in Hong Kong, where it has two branches. I loved the way it looked with the attractive red filligree lights matched with Chinese styled furniture given a lick of white paint that made it more mod vs fuddy duddy ancient. The menu is an interesting mix of Indonesian favourites like gado gado, perkedel and Chinese classics such as wontons, wonton noodles and even a double boiled shark's bone soup (one of my favourite all time soups for its abundant collagen). I left the ordering to Splashie Boy and he got really carried away with the number of dishes he ordered. I guess he just wanted me to eat since he knew I hadn't eaten any lunch that day. We absolutely loved the perkedel jagung (4 pieces for RM15) - fritters made with sweet tasting corn niblets and prawns chopped into pieces. Simply yummy stuff. We balanced out the sinful fritters with the healthy gado gado (RM18), a mix of long beans, bean sprouts, hard boiled eggs and potatoes topped with crackers. The most important part of this simple dish is the peanut sauce. While it had chunky peanuts and was aromatic, I felt it lacked an extra oomph that pushed it to greatness. We had great expectations for the tahu goreng telur (RM18), probably because it is not easy to get great ones here. Most places have stopped serving them and at best they were mediocre. One of the best ones I have tasted has been at Sanur in Singapore - a column of eggy custard wrapped in a crispy fluffy deep fried golden brown strands. At IR1968, they do things differently as it's more like an omelette filled with chunks of tofu. While it was fried to golden crispy strands and topped with lots of julienned vegetables, I was very dissapointed since I missed the other version. 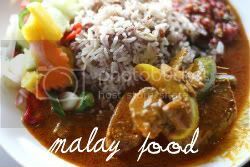 Usually served with just a drizzle of the sweet and addictive kicap manis, this more sophisicated version came with a peanut sauce (the same one used for gado gado) and fried shallots. Avoiding the ox tongue (a certain someone does not like to take ox tongue while I'm always game! 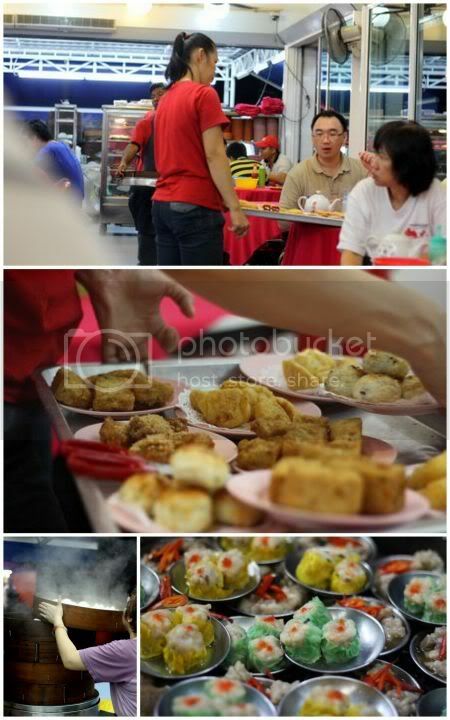 ), we ordered the safer dishes such as udang kuning goreng (RM42) - a type of prawns coated with a buttery sauce tinged with chillies. While the sauce was nice, I didn't like the mushy texture of the prawns that signaled only one thing - they're not fresh. Kambing bakar (RM32) was tender lamb cutlets served with a piquant sauce that didn't make out tastebuds burst out in song either. Our overall impression of the place - not so hot for our tastebuds as the food didn't have the mouthwatering oomph-la-la we were looking for. I'm not sure if it's still opening jitters but I reckon it will be a long while before we return for seconds to this place, unless our friends request otherwise. Yesterday saw me trawling the streets early in the morning, just to run an errand with my mother at the KLSE on Exchange Square. Thinking it will be opened at 8.30am per their website, we got there bright and early but instead the policemen at the counter told us that they ain't a government office and the offices only start work at 9am. Blessing in disguise as it meant we had time to get some morning sustenance, a rare occasion for me since I never wake up early enough to get any (I start work late about 10am, hence the later times) breakfast as it's always brunch! I have been itching to revisit Sisters, one of my favourite stalls on Jalan Alor for their to-die-for chicken rice wine noodles and this time round, I got my wish. Aside from their wonderful tummy warming chicken rice wine soup, they do a version with prawns and my mother discovered, they even sell frogs! 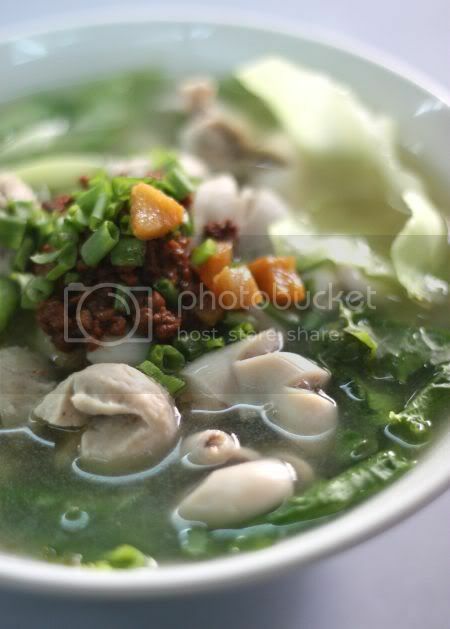 Imagine pairing the tender frog meat (a little icky sounding but it's damn tasty ok!) with the rice wine - simply yummylicious stuff that had me drooling at the thought of such a heavenly combination. My mother was a little skeptical about the chicken rice wine soup but she fast became a convert after one sip of the broth,. 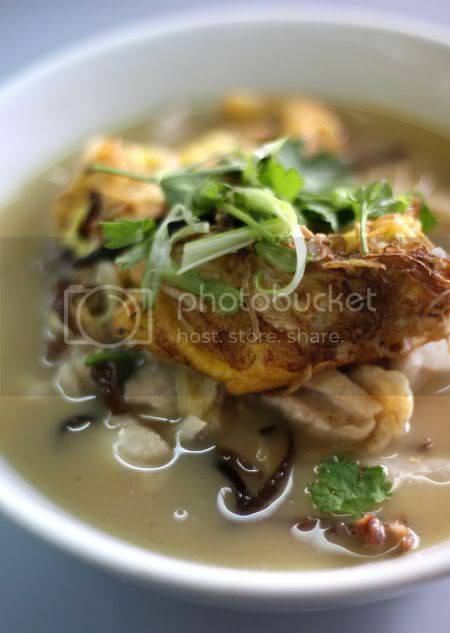 "Hmmmm, it's much better than the other Oriental (Oriental Cravings at 1Utama) place you took me before, " she declared while stealing another spoonful of the aromatic broth. She had ordered the pork noodles - filled with an unusual type of intestine called "sang cheong", which is said to be the small intestines from a female pig. Why do I have a feeling it's probably some fallopian tube thingy since it's gender specific. Anyway, it has a nice crunchy and slight chewy consistency, if you're adventurous. Maybe we should ask Andrew Zimmerman from Bizarre Foods to give it a try one day. Zimmerman should try this fallopian tubes! 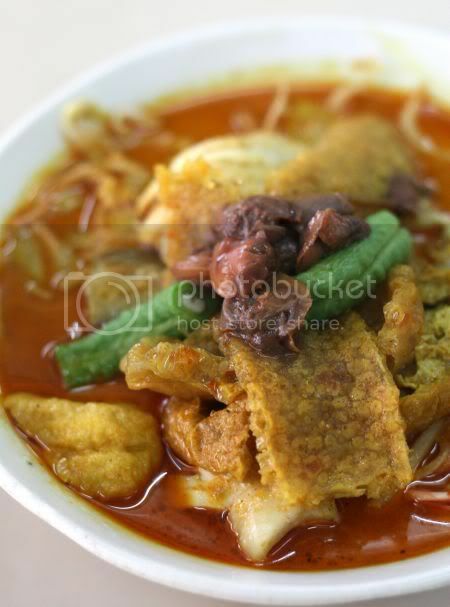 Another winner at the stall now run by one sister and her two sons - their curry laksa topped with sinful pork rinds and the most aromatic sambal belacan on the side. The sambal is so good that I can honestly eat it straight from the container. Yums! The tummy is rumbling as I type that statement. I reckon my next mission is to wake up early again (without an official excuse) and give that frog and rice wine combination a test run with the tummy and tastebuds. Read about my first experience from a previous blog post. Busy! Busy! Busy, and also not in the mood to blog. That kinda sums up my lack of blog posting for this week. 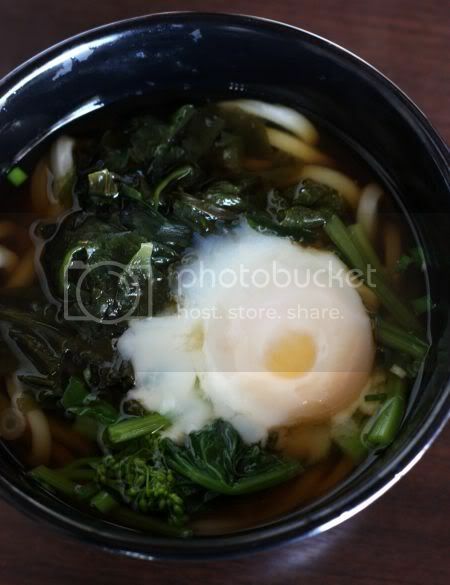 However, I did get a flash of inspiration to blog this time, after I finally cooked up the fresh udon I had gotten last weekend. After work around Old Klang Road and since it was way past lunch time meaning probably very limited or no choices at the hawkers, I decided to drop by Sanuki Udon for a quick bite. Even after the lunch period, the place was relatively full with around four tables. People kept coming in and out including two Japanese men who were brought there by two local gals. The simply outfitted place sits at a very quiet area behind residential houses. If it wasn't for the word of mouth, I doubt anyone would have have spotted this place. You go through the menu and tick with a pencil what you want: egg, seaweed, kariage and etc. I decided to go for the soupy version with a plethora of "additions" - a softly poached egg, wakame or seaweed and on the side the crispy deep fried carrot and onion shreds. 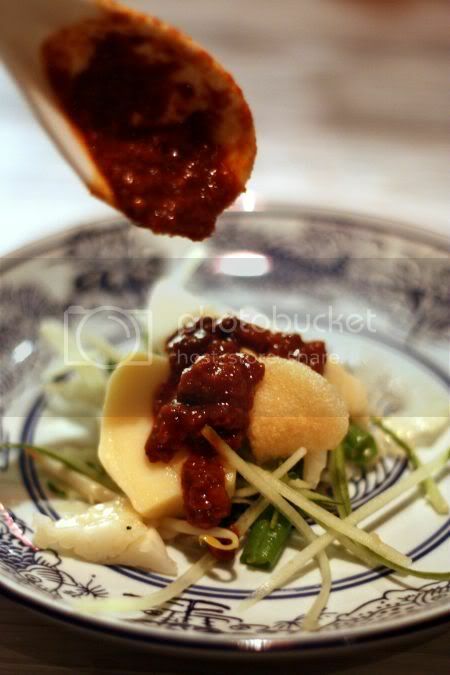 There's also other choices: just with egg or a cha cheong minced meat sauce that strikes me as more Taiwanese! While I felt some items weren't very Japanese (there's choy sum in the dashi soup and chili sauce on the side), the selection is pretty simple and easy for the kitchen to churn up. 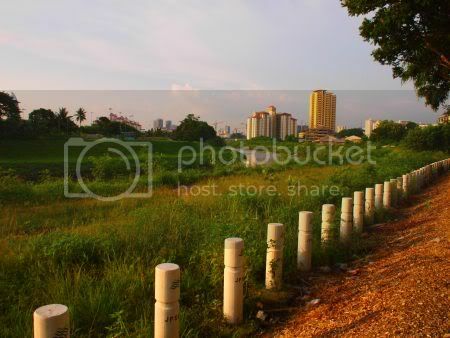 Moreover prices are very reasonable and ideal for this kind of neighbourhood. The noodle texture is good - slightly al dente but still soft enough. 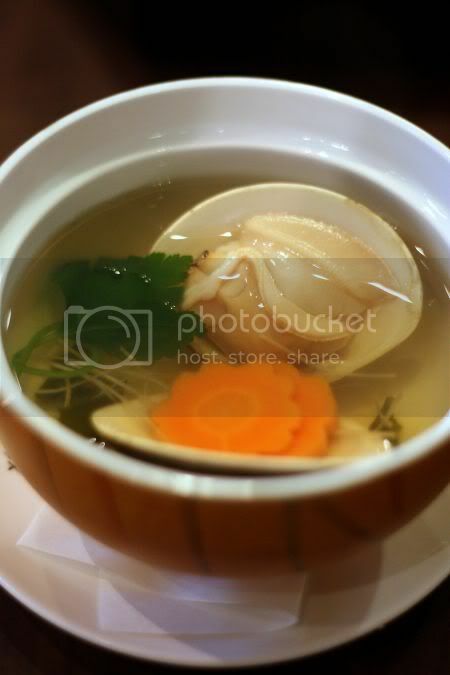 Didn't think much about the dashi soup or the other items within my bowl. I did enjoy the sweet taste of the kariage. As I loved the texture of the udon, I decided to get some for home - RM15 for a 1kg portion. Listening to the owner's instructions - treat it like wantan noodles, boil the frozen udon in hot water, then pass through cold water, wash out the extra starch under running water. I finally got to sample it last night at home. Being low on supplies, it was my favourite go-to recipe from Harumi Kurihara, her awesome minced meat miso sauce which I had cooked up a large batch. Looking through the fridge, I added mushrooms and carrot peels ran through with a vegetable peeler since I was lazy to cut into julienne. While I didn't get all the starch out, it was still very tasty and chewy. 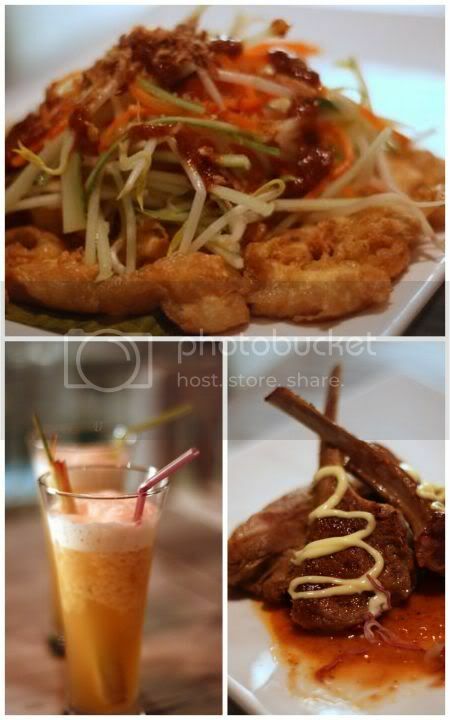 Yummy stuff that was slurplicious for a quick mid-week meal indeed. 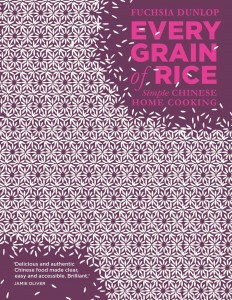 Next project for the remaining udon noodles - I reckon I should make my own version of black pepper seafood fried udon. A quick chat with the owner the other day revealed also the following - he makes the udon noodles with Australian wheat flour and machine. At the moment, he is only making enough for his 7-month old Taman Desa outlet and his recently opened Menara Cosway outlet. Incidentally I reckon the customers are all "blogger-friendly" as when I snapped a quick picture, I could hear comments from my other diners across the room, " this place very popular mah on the internet already." Happy Good Friday and Easter to everyone. Apologies for the absence.